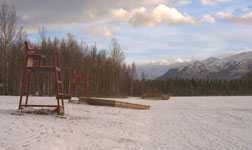 Winter came to Anchorage, a little more timidly than usual, in 1995. 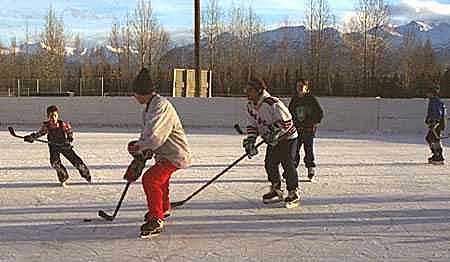 There was enough ice by mid-November for hockey in a neighborhood rink. Would one of these players become a future professional hockey player? Several Alaskans have, including Scotty Gomez, an NHL player for the New Jersey Devils, who grew up in the neighborhood where these boys were playing. But there wasn't much snow yet, so a snow machine was put to work at the Hilltop Ski Area. There are said to be 80 million ducks in North America. Quite a few of them spend the winter in Anchorage. 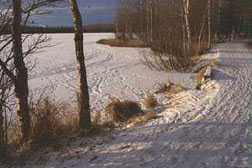 A stream on parkland in western Anchorage still had open water in November 1995. 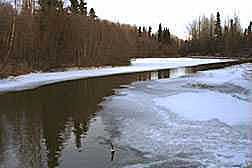 Goose Lake on the east side of the city was frozen solidly enough for the ice to support cross-country skiers. Winter was slowly putting its stamp on the land.